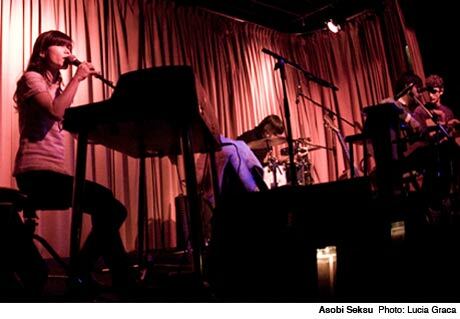 The New York new gaze outfit Asobi Seksu have gone acoustic. The four-piece usually thrives on distortion, pairing big guitars with soaring keys and singer Yuki Chikudate's vaulting voice to create a massive live show. However, touring acoustic disc, Rewolf, the band have dropped their My Bloody Valentine/Ride allusions in favour of stripped-down songs with new arrangements and an armoury of acoustic guitars. With a slight falsetto and mallets, drummer Larry Gorman encapsulated the band's current dynamic: prevailing prettiness sporadically punctuated by sonorous pounding. In front of a sat-down, pin-drop-quiet crowd, the combo delivered an occasionally beautiful, surprisingly diverse set that, thankfully, still included a bit of bombast. The band's twee-ish leanings came to the fore on the Azure Ray-evoking "Breathe into Glass" and the glockenspiel-heavy "New Years." Gossamer yet playful, both tracks showcased Chikudate's crystalline pipes. However, even in a restrained guise, the band were at their best loud. Evening highlights "Goodbye" and "Walk on the Moon" unleashed Chikudate and Gorman, who boomed stirringly, while "Layers" scraped the sky with glam-ed up keys. Conversely, "Meh No Mae" puttered quietly into the background and the typically huge "Thursday" faltered, importing a bizarre re-imagining of the melody from "Everybody Hurts" (never a good idea). Regardless, the show was mostly spry and often arresting. The affable band's playful patter kept things moving at a decent clip, largely - though not entirely - avoiding Storytellers-style anecdotes, while the breadth of arrangements kept things fresh. Asobi Seksu "Me & Mary"